The Salonika Front is arguably one of the most forgotten in terms of where British and Commonwealth troops served in the Great War. British troops were sent to the region in 1915 to help the Serbians, who were already beaten by the time the first soldier landed. However, a complex relationship with neighbouring Greece lead to thousands of British troops, later joined by French, Italians and Russians, facing the Bulgarian Army, an ally of the Central Powers, on the Salonika front. Again it mirrored the Western Front with an extensive trench system and while there were big battles here, especially in the final phase of operations in 1918, the greatest threat was from disease, especially malaria. By the end of the campaign more than 10,600 British soldiers had died in Salonika, many of disease rather than from bullets or shells. The troops of the British Salonika Force, as it was officially known, had many names for this theatre of war, some unpublishable, but the commonplace ‘Muckydonia’ summed up how many of them felt about being here and was a play on the region’s other name, Macedonia. 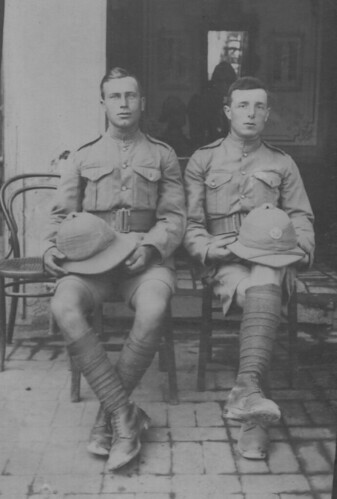 This images shows two British soldiers of the 8th Battalion Duke of Cornwall’s Light Infantry in Salonika in 1916, in a back area where street photographers took images of those out on ‘local leave’. They are wearing Khaki Drill uniforms, much lighter and cooler than the usual Khaki woollen tunics. The men are also issued with Wolseley Pattern Helmets, common attire in the the warmer theatres of war. This entry was posted on 17/10/2012 by sommecourt. It was filed under British Army, Forgotten Fronts, Great War, Salonika, WW1 and was tagged with 1914-1918, 1916, DCLI, Macedonia, Muckydonia, Salonika, WW1.